There is no X-Factor for ponds and water features in the UK, but their is the RHS Garden Shows but I talk about them in other posts. This post is about the best ponds and water features in the world. Trying to design and construct the best garden ponds and water features that I can is something that I really strive for everyday. to meet and collaborate with other first class garden pond and water feature professionals, so we can share new ideas, tips and tricks. The industry professionals I have met include pond contractors, other award winning pond and water feature garden artists and designers from many countries. Its funny how most of them all approach the way they design garden ponds and water features the same way. so they can concentrate on the way the features look, sound and feel, but their main aim is to meet their client’s brief. The best garden ponds and water features in my experience blend together many elements of the balanced eco system but have many different designs and styles. They should contain a natural Balance fish, alongside wildlife areas, plants and waterlilies, and moving water. 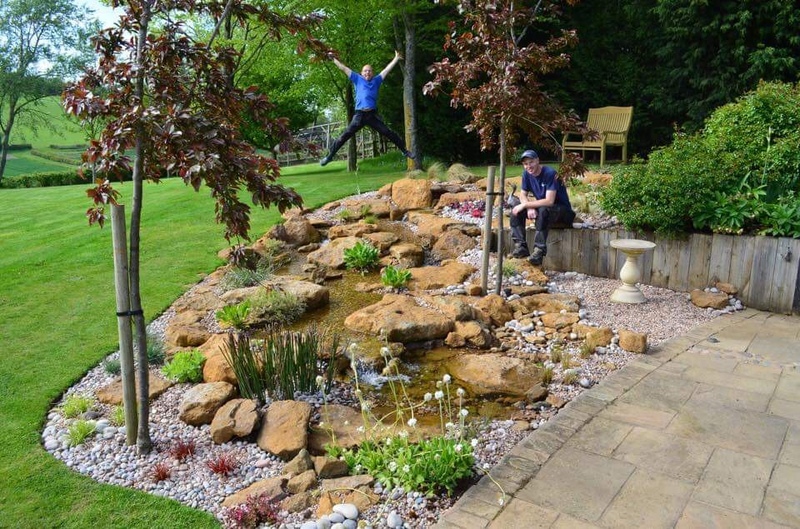 The best garden pond should be a complete ecosystem, containing rocks and gravel, plants, fish and wildlife and should manage itself, requiring little regular maintenance. After all, I want to enjoy the pond, not spend all my time maintaining it. For me, the best garden ponds and water features in the world must contain plenty of plants that are well kept and full of aquatic life. Lush plant growth is an essential part of a pond and this gives the design a more natural look that blends in with the rest of the garden. When the fish are larger, say over 8-10 inches, they will help to keep the gravel clean by stirring it up and as they feed and dislodging organic matter. This will certainly help the process of organic matter break down in the pond. The Best Garden Ponds and Water Features in The World that I have seen are all man-made, which might surprise you, but this comes down to the detail of the design and the research that has gone into them. Creating an ideal ecosystem-pond takes careful planning right from stage one, and is something that we do not really practice yet in the UK to any great extent. For that reason the best garden ponds in the world are ones that I have seen in the USA. The American’s really do have this style of pond elevated to a level of perfection that us Brits can only aspire to. I believe it will come and here at any pond limited we are biting at their heals. Having traveled widely around the world in search of the best man made garden ponds, I have seen lots and have made many new friends. 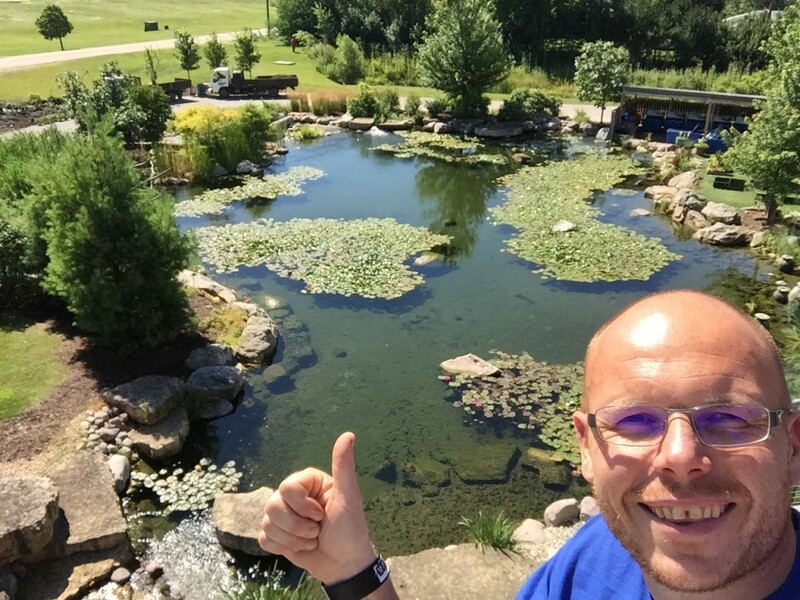 It’s amazing how many pond contractors from all over the world love hanging out with each other, networking and sharing tips and tricks with other pond people is my calling in life. I can now say with some authority that the American-style of building ponds and water features are the best looking ponds and water features in the world. In particular the Aquascape ecosystem ponds have opened up North America to a whole new world of water gardening. The key to their successful pond designs is that everything is kept in balance with a high turn over rate. The ponds are not over-stocked with too many fish, which helps to keep the organic waste production down and also they do contain plenty of plants, which not only adds to the over all design, but also helps to keep the pond in balance. Another key feature of the great garden ponds and water features is that all of the parts that operates the pond or water feature is completely hidden from view this include everything like mechanical equipment and pipe work and other plumbing. So all that you are looking at is crystal clear water, lovely fish and plants in their element. The pond has surface skimming to remove any debris that blows onto the pond. There is adequate flow that creates movement throughout the pond with no stagnant areas that will harbour dead water and eventually cause problems. If there are dead areas then jets are added to keep the water in motion. If you want one of the best garden ponds in the world they don’t have to be particularly deep. Most of the best garden ponds I have seen are medium size ponds around 3m by 5m by 0.75m. If there is adequate circulation and the pond is designed right the first time so there is nowhere for the detritus to settle then they will almost keep themselves clean and will flush through any waste without it accumulating on the base of the pond. The aim is to have a balance between the five key constituents of the pond, which are beneficial bacteria, rocks and gravel, plants, fish and a natural-looking design. Bring all of these elements together and I think you will have the makings of the best in the world.